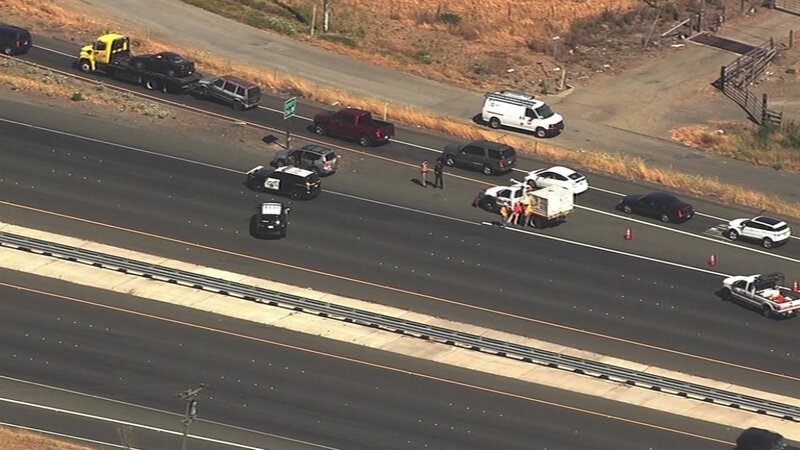 VALLEJO, Calif. -- A California Highway Patrol officer was injured in a crash while responding this afternoon to a pursuit on eastbound Interstate Highway 80 in unincorporated Solano County near American Canyon, a CHP spokesman said. The crash was reported shortly before 1:45 p.m. on eastbound Highway 80 near the exit to American Canyon Road, CHP Officer Dave Harvey said. A motorcycle officer was responding to the pursuit when he fell down onto the roadway with the motorcycle, Harvey said. No other vehicles were involved and investigators are trying to determine why he crashed. The officer was taken by medical helicopter to a hospital to be treated for minor injuries. The medical response and investigation into the crash has prompted the closure of all eastbound lanes of Highway 80. All lanes reopened just before 4:30 p.m.
No information was immediately available about the pursuit the officer was responding to.